New York University’s Kimmel Auditorium is usually reserved for award ceremonies, student performances and panel discussions. But on the last weekend of September, the sprawling space was littered with long tables and chairs, multiple power outlets, extension cords, laptops, notebooks, stationary and plenty of coffee. A group of approximately 35 people, split into teams, were huddled around various tables, working furiously on their computers with their backpacks carelessly strewn over the wooden floor. 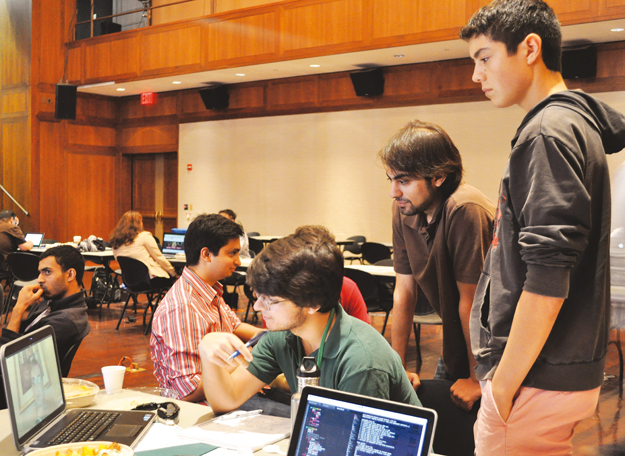 This was the annual Pakathon New York, a hackathon-style three-day event initiated across 16 cities in the US and Pakistan. The first Pakathon, which took place in Boston last year, was a unique collaborative effort to address some of the most pressing development challenges in education, human rights, finance, health and retail in Pakistan. Participants were encouraged to brainstorm solutions that could be implemented for sustainable social impact on the ground. This year, the initiative has spread roots to several locations in the US, Toronto and eight cities in Pakistan “Not everyone here is Pakistani. We encourage a global collaborative component and diversity of opinion as well as a mix of skill sets,” says Amna Khawar, the marketing and communications lead for the event, as she points to some of the teams. She elaborates that besides techies, social media junkies, programmers and developers, several participants were even graphic designers and lawyers, all united with the goal of leveraging ideas and moving it to action across countries. “We are not limited to simply expanding on a concept, business plan or building a prototype, but we also welcome ideas like developing an app or an SMS-based service,” explains Hassan Ahmed, the co-lead for Pakathon NYC, referring to the sizeable mobile base in Pakistan, which makes SMS the easiest way to reach the population. With over 120 people registered for the event alone in New York, the day kicked off with a meet-and-greet where teams were formed according to their preferred areas of interest and matched with professionals who had signed up to be mentors. “Mentors help the teams hone their ideas as they are from different walks of life — we have entrepreneurs, international development experts, human rights activists and even aid workers from UNICEF,” says Ahmed. He added that some of the teams were even connected to Pakistani mentors via Skype, who were helping them with on-ground knowledge and statistics. Each team, which could be anywhere between one to eight people, had 48 hours to develop and present a 10-minute pitch to a panel of three judges, comprising of individuals who have a development-focused, entrepreneurship and start-up background. 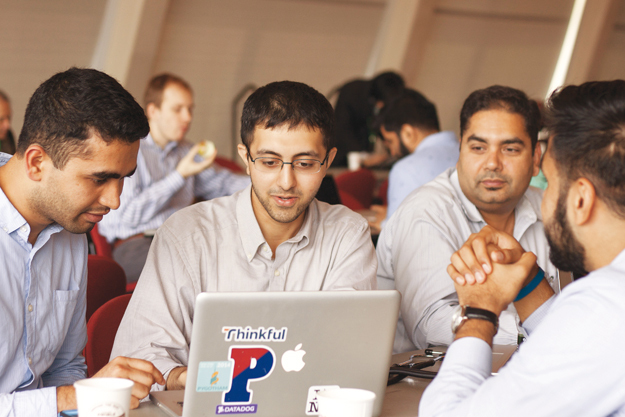 The winners from each of the 16 Pakathons then competed against each other for a $10,000 prize at the global Pakathon that took place at the Massachusetts Institute of Technology in Boston on October 11. While basic ideas that were in their early stage were given equal consideration, the most focused plan with the highest feasibility, marketability and chances of implementation would be given preference when it came to judging. Most of Pakathon’s financial support comes from online donations via a funding campaign by passionate people inside and outside of the South Asian diaspora who believe in the cause. Khawar also points out that ‘kind sponsors’ help with food and transportation costs. “Everyone has a common cause — to develop a community where ideas can be creatively reflected and put to constructive use,” says Minza Zahid, co-lead for Pakathon NY, who was also a participant at last year’s event. The project she worked on, known as ‘Asli Goli’, an SMS-based system to address counterfeit medicine in Pakistan by scanning its barcode to validate it, is being put into motion a year later as one of her team members is currently back in Pakistan. “Forty eight hours is a limited time so we don’t want to say that after that ideas should come to an end. In fact, this is a vehicle to put ideas to concrete use,” explains Zahid. Keeping this in mind, teams were working to come up with tangible solutions that were not only developed in a sophisticated manner but could also be translated into action. 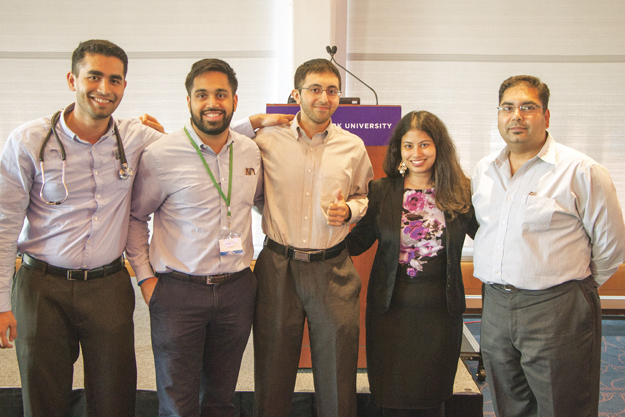 “Our team is in the health track where we are working to create a smart stethoscope called ‘SmartScope’, designed to measure more than just the heartbeat of a patient,” explains 28-year-old Sharmeen Noor, who is originally from Bangladesh. She added that the idea was viable as it addressed timely issues in Pakistan, namely the low doctor-to-patient ratio. A device like Smartscope could be very useful for hospitals and health clinics that do not have a first-mover advantage and lack equipment for diagnosis and triage. The team, like most others was divided in its duties — one of the members was researching statistics on the public healthcare market in Pakistan, while others were looking at value proposition and the social enterprise angle. On the next table, 21-year-old Mansoor Alam, a Pakistani and Irish descent student from Wesleyan University, was working on a hands-on tool to map the Urdu script and text and Romanise it. “[While] growing up, I always struggled as a second-language learner of Urdu and it’s frustrating to not be able to have a translation source that will clarify words and sounds,” he says. Alam and his team were in the midst of creating a dictionary of letters from the Urdu alphabet so that they could ultimately create a mechanism to extract the script from a newspaper for example. While Alam knew that his project was more research-oriented, he was glad that the idea was at least set in motion. Across the auditorium, two Indian girls were working on launching ‘DriveHer’ — an Uber app, which would provide a cab service for women with female drivers. “I grew up in Delhi, where issues like gender, women’s rights, safety and economic empowerment are at the forefront,” says Anahita Arora, one of the two-team members. 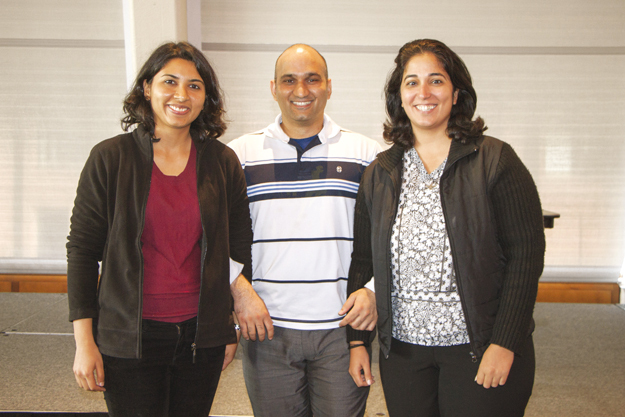 “Given the social and cultural similarity between India and Pakistan, the idea resonated with me.” Her partner, Delkash Shahriarian, added that they were also looking to add a security layer to this project where an off-duty female police officer or SOS button could be added to the cab during travel. Both reiterated that ventures like Pakathon bring together some of the best minds, where ideas can be exchanged and refined further. Both the SmartScope team and DriveHer team tied for first place in Pakathon NY and competed at the global Pakathon this past weekend. The team that took home the first prize in Boston based on its prototype and projected business plan, as well as marketing and implementation strategy was Rural Agricultural Technologies (RAT) from Atlanta, whose vision is to bring a paradigm shift in the agricultural sector of Pakistan by employing modern technology and educating the farmer. “Even if some of these projects are a work-in-progress, I am happy with this turnout as it’s a stepping stone for growth and innovation,” says Khawar. She adds that for the Pakistani diaspora, events like Pakathon are a way to give back to their homeland. Moreover, for participants who are not of Pakistani heritage, it is a way for them to learn more about a country that is misrepresented and always under global scrutiny. “Only a community of voices together can address change of any kind,” she says. Published in The Express Tribune, Sunday Magazine, October 19th, 2014.